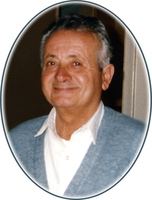 Provide comfort for the family of Costantino Frasca with a meaningful gesture of sympathy. With sadness, we announce the passing of Costantino on April 12, 2019 at the age of 86. Beloved husband of Maria and cherished father of Lucia. He will be missed by his many cousins, nieces and nephews and their families. Visitations will be held at Bernardo Funeral Home (2960 Dufferin St., south of Lawrence Ave. W.) on Tuesday April 16 from 2-4, 6-9 p.m. Funeral Mass will be celebrated in St. Norbert's Church (100 Regent Rd., at Ancaster Rd. - north of Wilson Ave.) on Wednesday, April 17, 2019 at 10:00 a.m. Entombment will follow at Holy Cross Cemetery (Bayview Ave. & Langstaff Rd. - south of Highway 407). In memory of Costantino, donations may be made to the Heart & Stroke Foundation. To plant a memorial tree in honor of Costantino Frasca, please visit our Heartfelt Sympathies Store. We encourage you to share your most beloved memories of Costantino here, so that the family and other loved ones can always see it. You can upload cherished photographs, or share your favorite stories, and can even comment on those shared by others.